Clear Poly with Reinforced Handle for Coin. 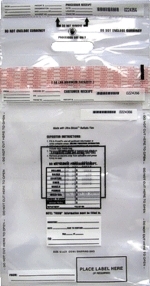 Tamper Evident & Top Loaded, In Stock. Write-On From, To, and Money Amount. Bag and Tear-off receipts - numbered. 6.5 mil thick clear poly. Meet Federal Reserve Bank specifications. 2 Sizes in Stock, with handles. Inquire for Poly Currency Bags. Sizes - 10" x 15" - 12" x 21"